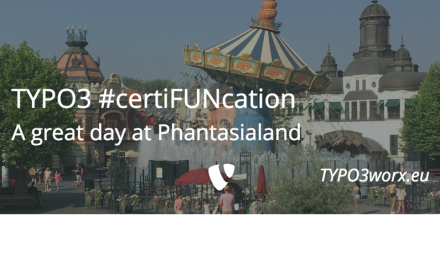 Today is the last day for grabbing an early bird offer for the TYPO3 Alumni #certiFUNcation Day on the 5th of June, 2015 in one of Europe’s biggest theme parks: Phantasialand near Cologne, Germany! Join, learn, and meet present and future TYPO3 Certified Integrators! So what is this all about? The TYPO3 education team is organizing a day full of workshops and fun for all current or future TYPO3 Certified Integrators. And here is the best: Just by attending the mandatory workshops your certification will be extended for an additional 12 months! Theme park entrance fee including one hour of exclusive rides with the Black Mamba rollercoaster! If you ever thought about doing the TYPO3 Certified Integrator exam you should definitely have a look at this offer! For a really cheap price you get the certification, the preparation workshop and a day full of fun. And if you’re already certified, you can easily prolong your certification without doing a the exam again! All info and a detailed FAQ about the event can be found here. Tickets are available here. PreviousRethink Publishing – Is Artisanal Publishing the Future?